Use for breeding preparation in a mixture with 1 to 3 Maintenance and as a staple food for large parrots. In a separate mixing and pelletizing plant our manufacturing operation Hommersche Mühle GmbH manufactures tasty and wholesome parrot pellets since July 2001. This is strengthened by Dr. Stephan Dreyer, feed expert teaching at the University of Stuttgart Hohenheim who assists our team of experts. All coarse materials are in food quality, strict incoming inspection ensures the quality ingredients as well as the permanent critical monitoring of production processes and results. To which we are not using residual or by-products, such as pulp and / or grains as mostly used. We dispense on the accepted, but rightly proscribed, saline and glucose addition as well as artificial colorants and fragrances. 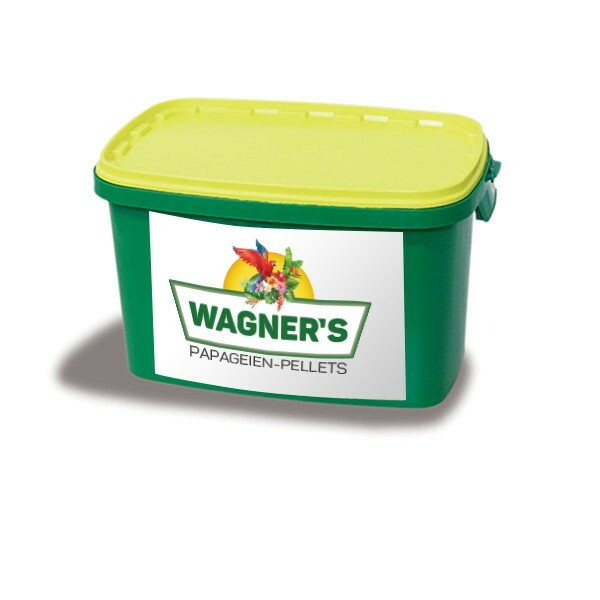 Our authentic pellets offer the following advantages: With each individual piece the bird picks up all the nutrients contained in our pellets. Therefore an unbalanced diet by selecting individual grain variations (including high fat seeds, such as sunflower seeds etc…) is not possible. Our pellets ensure an optimal basic supply of all essential vitamins, trace elements and minerals, which eliminates the need of the addition of a vitamin. Our pellets are characterized by a well balanced content of proteins, carbohydrates and fats and because of this are easy to digest. With the help of coarse components our pellets are adjusted to a natural diet. The gizzard therefore is forced to "work" even when being fed pellets. Our selected suppliers have confirmed to us that the raw materials are not delivered from genetically modified seeds, do not contain genetically modified organisms and are not irradiated. Unlike extrudates (with undesirable and avoidable starch breakdown, too little crude fiber, poor energy-protein ratio or overheated production) our Pellets = compacts are preferable. They are compressed only through frictional heat, with beautiful natural starch, compared to raw fiber compacted animal humanely and in accordance with freely selectable energy content. A detailed elaboration of these important final feed-differences is available on call. Furthermore, we do not recommend our high quality products despite vitamin enrichments and trace elements supplementation for use as a complete feed only. Fruits and vegetables, germination and cooked food, treats and snacks are still important in the age of production of finished feed as a rich supplement. Note: Please specify the type of your bird in your order! links "High Energy Pellets for Parrots - 4,5 kg - MEDIUM"
customer reviews on "High Energy Pellets for Parrots - 4,5 kg - MEDIUM"